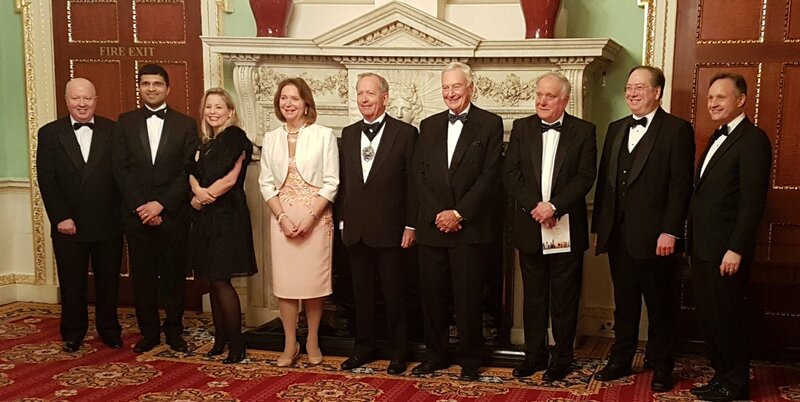 You can spot Ruth on the left, with Angela Knight in the centre who chaired proceedings, and Alderman Alan Yarrow both as Chairman of CISI and as Lord Mayor Locum Tenens. The pre-debate vote was neck-and-neck, 51% “no” (Antony and my side) and 49% “yes” (Ruth and Nikhil’s side). From the questions it appeared a hostile audience to Antony and me. I had that queasy feeling you don’t like when you’ve volunteered for a competition just for the fun of it, then suddenly realise you could lose in front of all your friends. How can one’s self-esteem ever recover? Thus it was a genuine surprise, and relief, to find that we moved the audience significantly to our side, 73% to 27%. Whew. Lord Mayor Locum Tenens, Your Excellencies, Fellow Aldermen, Distinguished Guests, Ladies and Gentlemen. You heard Antony’s compelling words. My argument balances his. 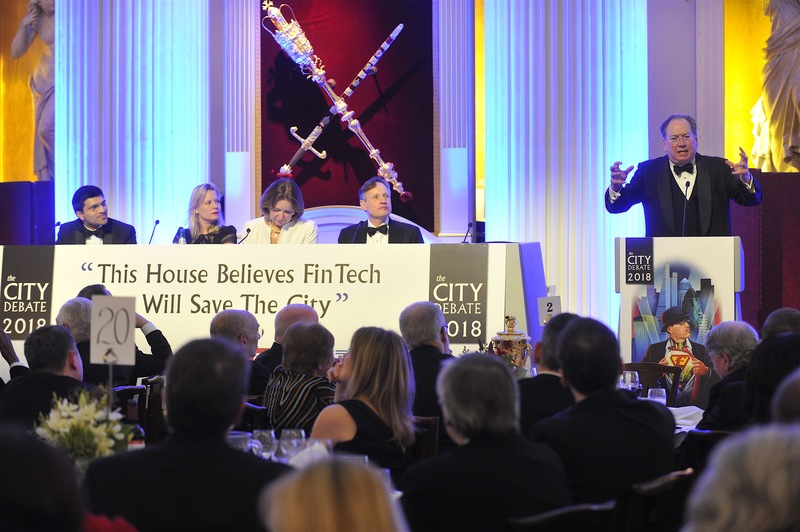 If Fintech doesn’t destroy you, then … Fintech will remain, a small comfortable parasite on the technology and trade centre that is our global City. 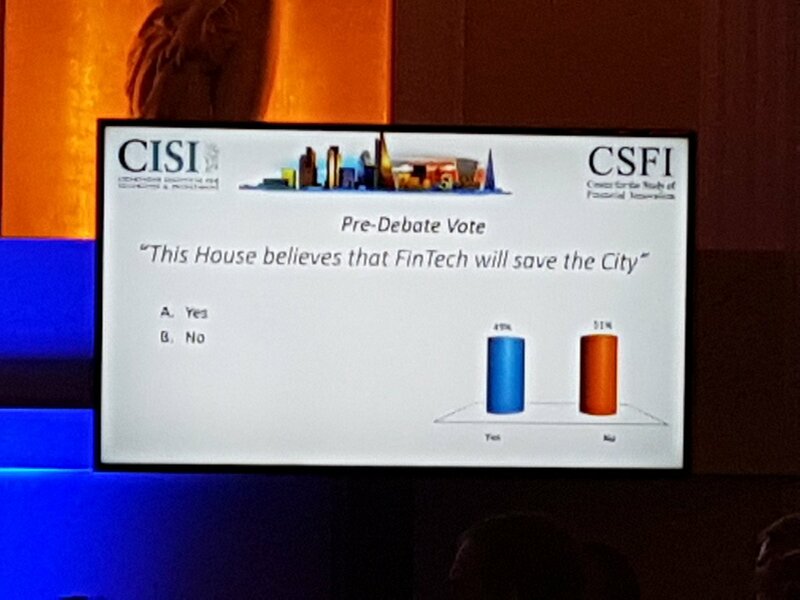 So what is the City, what is Fintech, what needs saving? Yesterday, the Inspector of Ancient Monuments assured me that London’s archaeological evidence proves over 100,000 years of trading. I ask you, many of you too also ancient monuments before me, to join together and take a long-term perspective. Bloomberg across the road sits above two millennia of Londinium. We convene over a millennium old stocks market. Gresham’s Royal Exchange opposite is over 450 years old. With the tragic exception of Edward I’s expulsion of the Jews in 1290, what distinguishes London is that, by comparison, it has treated all comers from outside the walls fairly, so long as they adhere to “meum fidem, meum pactum”. Lombards, Huguenots, Rothschilds, Warburgs … Mainellis. We are an SME City. 24,000 businesses provide 483,000 jobs in the square mile, with 1,200 more each year. Yes, 250 firms provide 50% of the jobs, but they work with 23,750 deal-making SMEs. Large and small produce 3% of UK GVA from less than 1.5% of the workforce, three quarters of the UK’s services trade surplus, some £68bn. Urban legends mislead us. The City was a deal centre before and after WWI, but was a feeble financial centre from 1939. The finance legend was kept alive by Italians and Americans, Autostrade in 1963 creating Eurobond markets on neutral territory. When Thatcher lifted exchange controls in 1979 and Big Bang broke cartels, financial services boomed. Most of today’s behemoths were SMEs 30 years ago. Bloomberg dates to just 1981. You’ve heard of a Baker’s Dozen, 13? I recently learned that a Banker’s Dozen is 11. Just seven banks, not even 11, gets you to over 95% UK market share. Cartels remain. Domestic banks pursue a decades old, yet rational, strategy of hampering account switching. If you want to be a success in retail Fintech, go to a country with over a thousand banks, Germany, or over six thousand banks, America. Make some marketing director’s career rather than annoy a UK bank strategist. M-Pesa in Kenya dates to 2007, eight years before the UK notices Fintech. Retail Fintech kids unable to afford desks sit in Level 39 beside the compliance & admin battery hens of Canary Wharf, while Berlin, a quarter our size and not a global financial centre, raises more Fintech finance than we do. China has 13 Fintech unicorns to our four. Even that requires forward-dating things like WorldPay, 1995, just to fake our numbers up. Then we put our regulator in charge of a sandbox, letting government bottlenecks choose our winners. Any country whose regulator is in charge of innovation has deep problems. The wider City is lawyers, accountants, maritime, insurers, not a fintech pimple. Google Trends awards the term ‘Fintech’ around 100 points. In January 2015 it was an insignificant six points. Our government claims creation of a sector it didn’t even notice four years ago, putting some mobile app lipstick on the antiquated systems of some oligopolistic banks. I came to the City in 1984 to put computer technology into Messels, then Shearson-Lehman-Amex. We old-timers should celebrate the progress of automating wholesale finance. We’ve been doing real Fintech long before this insulting term was mashed up. It’s as facile as saying your heartbeat keeps you from dying. London is a science & tech city. 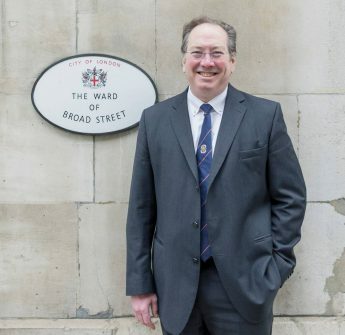 From Tudor ‘New Learning’ to Gresham College, Francis Bacon, the Royal Society, Industrial Revolution, Wheatstone telegraph, or DNA (the work was done at Kings, not Cambridge), London has been at least as much about science & tech trade as it has been about finance. Technology-Media-Telecomms is a significantly larger percentage of firms under 100 employees than finance, insurance, or professional services. Our centuries of tech drive regtech, instech, arttech, filmtech, songtech, medtech, edtech, traveltech. Finance moves with technology too, from cuneiform to papyri to tally sticks to spreadsheets to databases and now databases-plus, smart or distributed ledgers, blockchains. But smart ledgers are ‘wide tech’ for identity, documentation, and agreement exchanges, not just payments. Tech is for all sectors and the City of London is the most intense place on the planet to do tech deals. So does the City need saving from Brexit, the wider UK, perhaps AI? To paraphrase Streisand, “people who need to trade with people, make London the luckiest City in the world”. As long as we focus on face-to-face, commercial, global deal-making that AI and telecoms can’t replace, deal support will thrive, from financial and professional services to hotels, culture, healthcare, or entertainment. With or without Brexit, we need quality education and training, health, infrastructure, broadband; airports (plural); an in-visa-ble as possible access to people; a functioning housing market; a simple tax system. If Britain is open for business, try opening a bank account. What always needs saving is the rule of law, innovation, and open deal-making. We are deficient, but not desperate; in danger of having our Emperor’s clothes disrobed, but with time to knit some new garments. In conclusion, profound changes would be needed to even start to be a standalone Fintech centre. Silicon Valley, in total, is still only half the size of London. Fintech propaganda hides three decades of wholesale finance automation. Our real strength is over 500 years of wider technology and open trade. 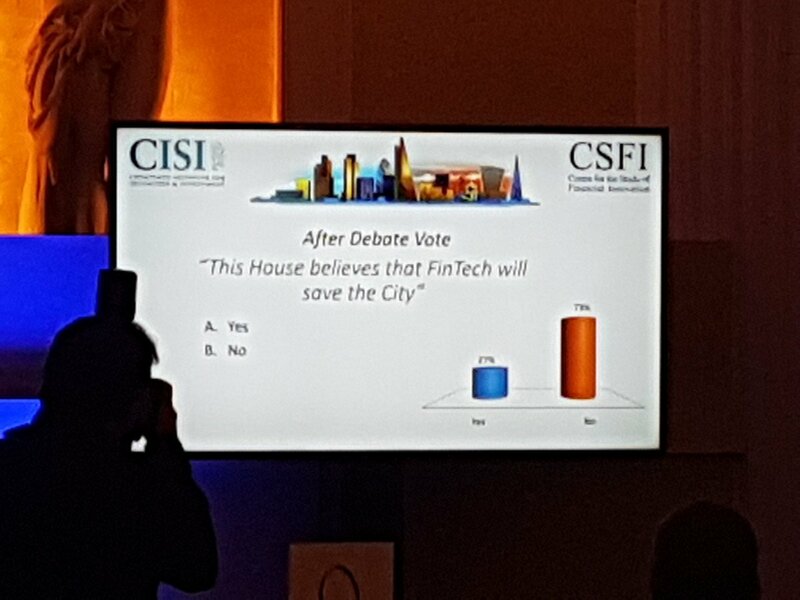 Sell Trade in Tech not Fintech. So, do you vote for deep tech or mobile gimmicks, do you vote for City deals or for Canary Wharf turkeys, do you vote for people or machines? Our centuries of success are built on growing SMEs in open, global trade, not some three year old government mashup. Please vote for yourselves, the deal-makers of London, not this facile motion.